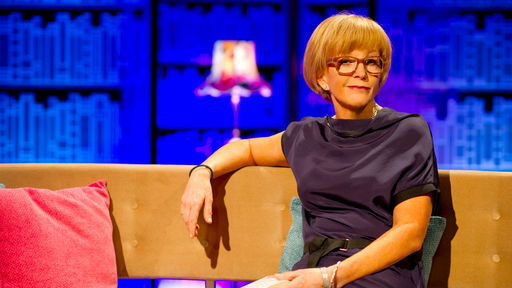 Recently I have been confined to my house for health reasons and have been mainly watching My Life in Books, a BBC series presented by Anne Robinson which features various famous faces talking about books which have influenced them in their lives. It has been entertaining for several reasons. Firstly, it satisfies the need in me to talk about literature and discover new books to read. Since watching this programme I have been on a feverish quest to make a list of every book I want to read EVER. It is growing daily; one book will lead to another which leads to another. It will take me years to read them all, and there are some of them that will probably never even make it onto my bookshelf. Another reason it has been interesting is learning about the lives of famous faces. I’m not talking about your average celebs, I’m talking about authors such as P.D James (or to give her full title, Baroness James of Holland Park) and Jeanette Winterson, the Duchess of Devonshire (Debo, youngest of the infamous Mitford sisters), the editor of British Vogue Alexandra Shulman (who it turns out had quite a bohemian start in life before adopting her now tee-total lifestyle), the two people who were on with their rich heritage (actress and what’s his face who had connections running back), and actresses Natascha McElhone and Anna Chancellor. There are male guests too of course, Keith Allen, Richard Bacon, Dan and Peter Snow, Sir Trevor McDonald and Nicky Haslam, so all in all quite a varied selection that makes it interesting watching, even if books aren’t quite your thing. Anyway! The point of this post is that the programme got me thinking about which books have influenced my life so far. I’m only 23 though so I’d like to hope that I still have three quarters of my life to go… So shall we say, My Quarter-Life in Books? I think that would do as a starting place. 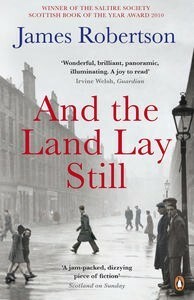 I started reading James Robertson’s And the Land Lay Still at an oddly appropriate moment. David Cameron had just lain down the gauntlet over the referendum on Scottish independence and Alex Salmond and dozens of MSPs and MPs dove in to give their opinion. The novel is preoccupied with Scottish identity, and thoughts of independence are never far from the surface, exploring the social and political landscape of Scotland through various voices. “like a slate we could not clean / of characters, yet could not read, or write / our answers on, or smash, or take with us”. “It isn’t in the castle / It isn’t in the mist / It’s a calling of the waters / As they break to show / The new Black Death / With reactors aglow”. In his novel, Robertson presents various fragments and snapshots of Scottish life and the novel is framed by Michael Pendreich’s attempt to organise his father Angus’s photography for an exhibition, and the exhibition itself. The book doesn’t follow a linear pattern and in Mike’s attempts to rearrange his father’s portfolio, we come to see how little chronology matters, and how a nation can only begin to be portrayed through multiple voices from different generations and backgrounds.